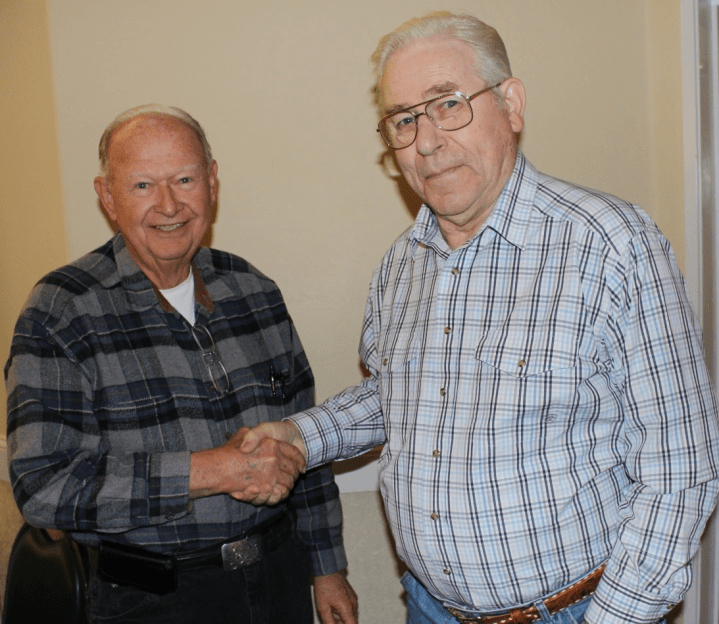 Friant Water Authority Chairman Harvey Bailey (left) thanks retiring Pixley Irrigation District President Thewis Atsma. Atsma attended his final Friant Water Authority Board meeting December 14. He began representing Pixley on the old Friant Water Users Authority board in January 1997 and was a charter Director when the Friant Water Authority was formed in 2004. Atsma has represented Friant water users in Washington, D.C., on several occasions and has been active in the Association of California Water Agencies. He has been a PID landowner since moving to the Pixley area in the late 1970’s. He emigrated from the Netherlands to Canada when he was in his 20s before moving to California where he started in the dairy business. In a resolution, fellow PID directors said Atsma “served the landowners of the District with honor, wisdom and dignity, was a tireless advocate for the District, and had the respect and admiration of his fellow board members, staff and landowners.